Status in Hawai’i: Alien. Nasty spines. Mexican Poppy is a pandemic (global) plant with a potentially lethal smorgasborg of alkaloids and uses. It is used world-wide as a pain reliever and wart remover. The seeds are expectorant, sedative, and the seed oil is a purgative. They make a good salve for injuries and bruises. The plant is used topically in Peru for muscle aches. Native American tribes used it topically for burns, wounds, hemorrhoids, sore eyes, and for lice. 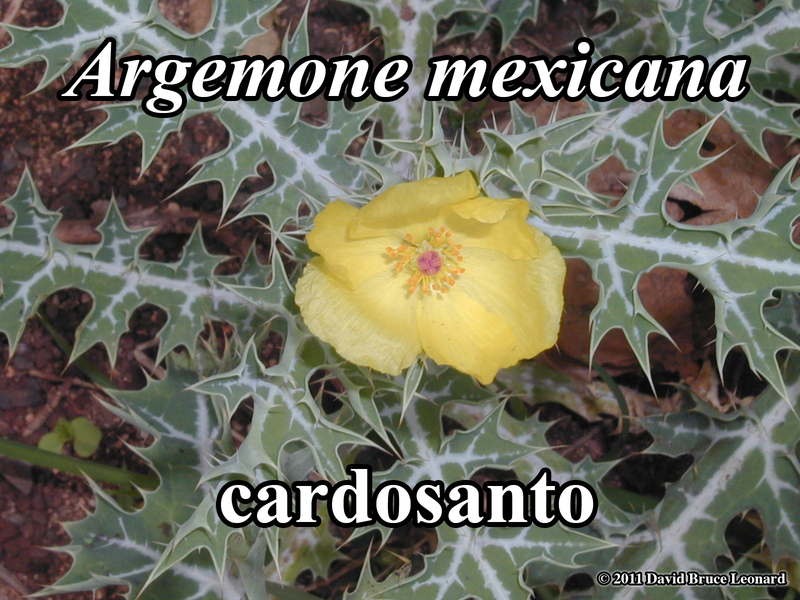 Argemone is a Greek word denoting herbs that are healing to the eyes. 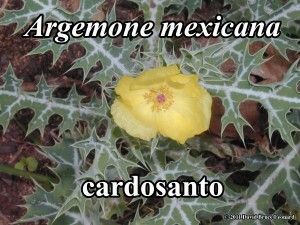 Used in Europe since 1597, Argemone mexicana is known for its treatment of insomnia and as an aphrodisiac. It is sometimes used as a substitute for other illegal plants. Research shows that Mexican Poppy may be useful in treating cancer and certain alkaloids inhibit viruses, bacteria, and fungi. Cautions: DO NOT USE THIS PLANT. For informational purposes only. Known to seriously aggravate glaucoma. People have died from eating food contaminated with oil from this plant.